A feature that we have been toying with for a while on BracketCloud has been the Twitter Match Ticker. We've gone through several iterations of development but we've finally finished development and this feature is ready to use! What is the Twitter Match Ticker? You are able to auto-tweet match results as they are entered for your tournaments. It's a great way to keep engaged with your community! First, go to your Twitter settings page and click the link to Associate a Twitter account. You'll be redirected to a page that looks something like this: Authorize the app and then you're ready to go! 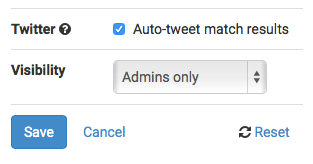 You can turn on the Twitter Match Ticker in the settings of any tournament you admin. Happy tweeting! Note: For any of you who have previously tested our Twitter integration features, you will need to associate your account again. Amongst various bug fixes and improvements, in this version we have added a new Bracket Standings tab and the ability to associate user accounts with team members. The new Bracket Standings tab provides you with an easier way to see Bracket tournament ranking positions. + Team members now associable with BracketCloud users. + Updated various vendor libraries versions. + Fixed scroll issues with embedded tournaments. + Added support for Safari and full-screen tournaments. + Minor fixes and performance improvements. BracketCloud set out as an answer to the popular question, "How to make your own tournament bracket?". Long gone are the days of scribbling what you think is the correct method of drawing single or double elimination brackets on a piece of scrap paper or white board. 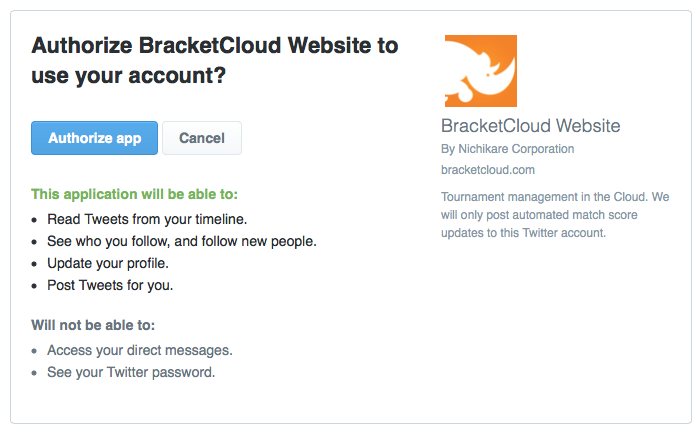 Now, with the power of the Cloud, you are able to host your brackets safely online for free with BracketCloud. See that form on your right? Just fill that out and click the link in the verification email and you'll have your first tournament bracket! Here is an example screenshot from a 512 player single elimination bracket. Brackets are available in a variety of formats whether it be a 8 team double elimination bracket, 16 team bracket, 32 team bracket or even 256 team bracket! 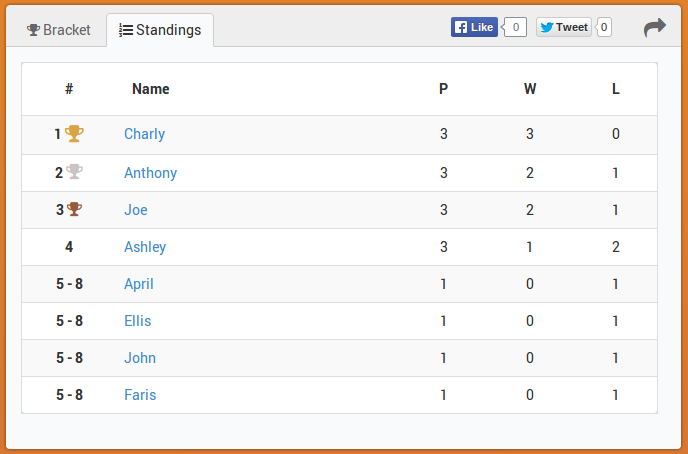 Round Robin is for scheduling group stages and leagues where all teams play each other and are ranked based on points. Ladder tournaments are a way to let teams challenge other teams in an on-going league. 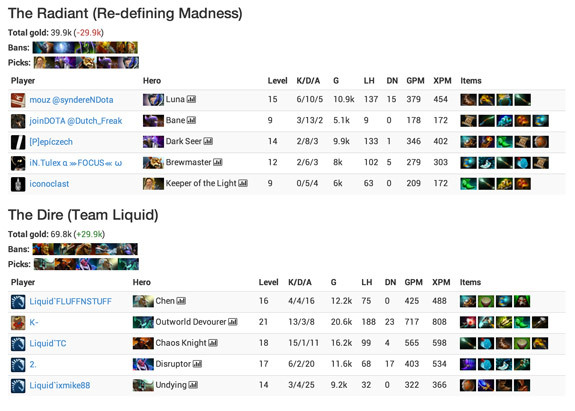 Teams are rated based on their results with either ELO or EXP calculations. Hybrid tournaments allow you to make multiple stage tournaments. For example a round robin group stage that follows into a playoff bracket. BracketCloud holds a large number of features that we can't wait for you to try. And we're adding more every day! If you have any questions or require support, please see our support page. Hi there! I'm going to give you some news about what we are working on here at BracketCloud. Almost there! We are working hard on this new type of tournaments which will be available soon! Ranked participants by ELO or EXP with cool level bars. Challenge system in which every participant will be able to easily create challenges against each other. A Match Finder, so any participant can post an anonymous challenge at some date and wait for an opponent to accept. Everything in real-time so you can watch the ladder unfold in front of your eyes! Heads up! We added the ability to set custom date times, so now you can set a match date time to something like 05:38. Through the brilliant web app OneSky we are able to manage all translations of BracketCloud in an open cloud environment. Anyone can translate BracketCloud into their language or make improvements to current translations. You can visit the translation dashboard here. Updates every minute - View full tournament There is a bunch of exciting new features that will be added to 1.2.4 expected to be released in the next fortnight! This is the change log for version 1.2.2 of BracketCloud. It's that time of month again. In this blog post I will update you all on the development of BracketCloud. Stage 1 is complete! You can now embed your tournaments as an iframe by simply clicking the share button on the tournament page and copying the iframe html code. We are now working on Stage 2, which will entail advanced embed settings. Through these advanced settings you can fully customize the appearance of the widget to match your sites style. ETA 2 weeks! Complete! Simply switch to the Participants tab on your tournament pages to find the new management interface. We built out two highly requested features here. Custom fields and team member management. If you have any feedback or suggestions please get in contact with us on Twitter at @BracketCloud. Hindi and Japanese translations have been installed. Next up will be Spanish. We're still looking for more translators so please get in touch! BracketCloud works with Google Drive! Simply go to your Google Drive dashboard, click Create, "Connect more apps" and search for BracketCloud. This allows you to organize your tournaments within your Drive! For those running sites on Drupal, we have started development on the BracketCloud integration module. It's open source so do check it out. We have released tournament embedding! See below for an example. You can now go to your tournament page, click Share and copy an iframe HTML code to embed your tournaments on your own pages. In our next update you will be able to theme and customize embeds so if you have any specific requests for ways in which you want to alter the embed object, let us know! There has already been a large amount of feedback, suggestions and bug reports which really helps shape the future of BracketCloud. This blog post will detail the current beta development status. We successfully launched BracketCloud earlier this month with less teething issues than we had forecasted. This has allowed us to move on swiftly to completing new features. We're almost finished building embeddable tournaments. We focused strongly on user customization, to help you fit in the widget to your sites theme. We will push this feature to production in the first week or so of June. We are building a separate tab on tournament pages solely for advanced management of Participants. On this tab, you can easily create, edit and remove participants. We will also be providing Team functionality where admins or team leaders can specify the members of their team. One of the most powerful features is custom fields. Using this, you will be able to set custom fields for your participants and specify if they are presented on the sign up form or are for admins eyes only. For online gaming, we plan to improve these even further in future by interfacing with game APIs to validate game IDs, player names etc. 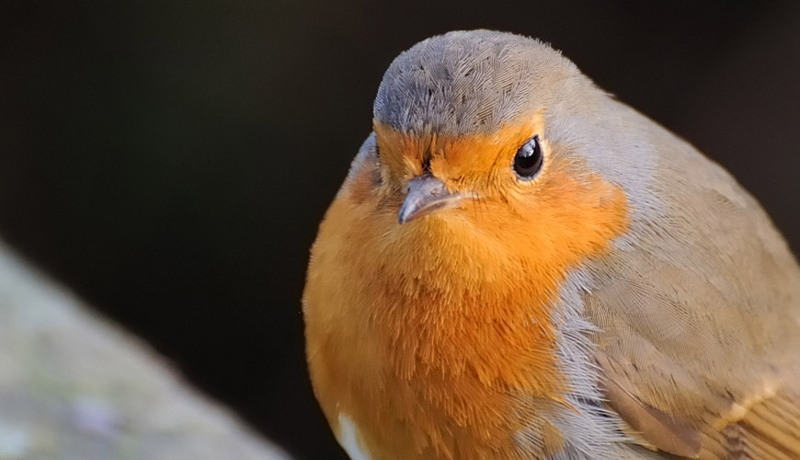 The API implementation of Round robin tournament types is complete. We will continue to build the client side functionality through-out June and hope to launch this before July. We recently launched our Malay site translation. Over the next week we will launch Japanese, Spanish and Hindi versions of BracketCloud. If you want to contribute and help translate BracketCloud into your own language, please contact us on Twitter via @BracketCloud! BracketCloud was created for a simple reason - to improve the quality and frequency of competition. Building upon years of experience in tournament web systems and sports management software, we were able to take BracketCloud from conception to launch in just 3 months of development. BracketCloud was constructed using brilliant modern open source technologies such as Drupal, Node, Backbone, Marionette, Underscore, Bootstrap and numerous consumable APIs and CDNs. Today marks the first day of the Beta phase. During the next weeks, we will listen carefully to your feedback as we continue to integrate new features. Is something broken? A feature that doesn't feel just right? Do you have an idea? Your feedback helps us to build the best tournament management tool available. Please send us your feedback! To keep up to date with our activities you can follow us on Twitter and Facebook. आगे प्रोसीड कर के मैं ब्रैकेट क्लाउड की टर्म्स ऑफ़ सर्विस ऑर प्राइवेसी पालिसी को मानता हूँ. क्या आप अप्ना पासवर्ड भूल गए हैं?